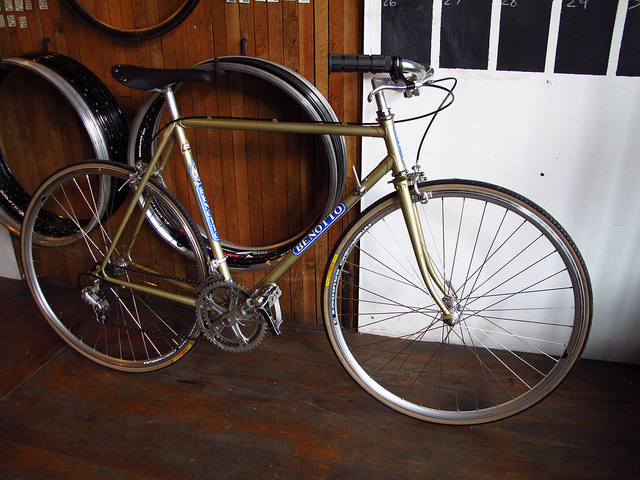 This is a more entry level Benotto we tracked down, took apart, cleaned up and rebuilt.All of the original components were used and most were industry stamped parts markedwith the Benotto name despite who originally made them.We built up a new clincher wheelset with Miche hubs and Ambrosio Balance rims. For bars we decided to go for a more upright city friendly vibe. It didn’t sit on the floor long before being snatched up by a stoked customer looking for an affordable comfy ride with a vintage Italian aesthetic.